The Codex Cospi was once thought to be Chinese! PLAY: sound bites - music Az Tec plays it! Occasionally even experts make mistakes! Here (choose an instrument from the right-hand menu) we offer images and sounds of a small group of COPIES of clay wind instruments; taken together they give a hint of how Aztec flutes, whistles and ocarinas may have sounded – but note the caution above, and also bear in mind that these recordings were made by our good - English! 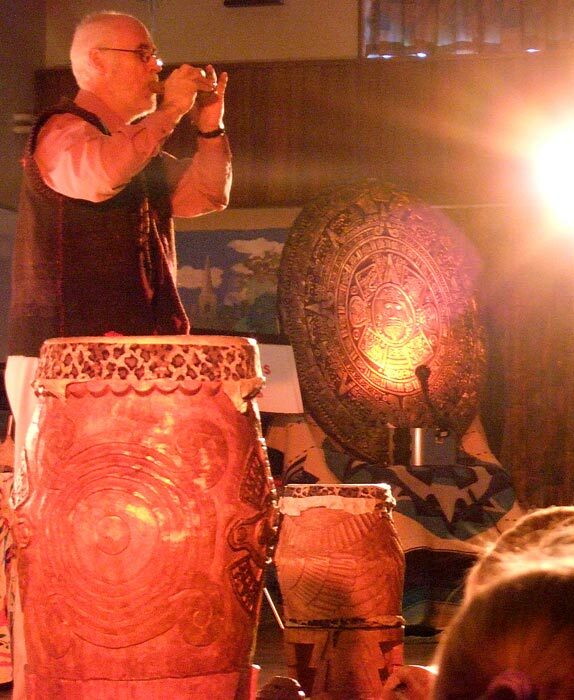 - friend Will Summers of Tunkul... To hear the sounds of some ORIGINAL pre-Columbian instruments follow some of the links below. You can hear some of Tunkul’s music accompanying Tec in our Kids Aztecs microsite (click on Kids at the very top of the page); and you can hear the sound of the teponaztli drum in our fully illustrated feature article (follow link below). • Would you have got it right? 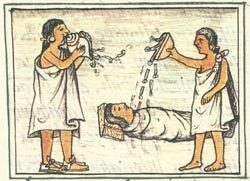 Have a look at the codex picture below (pic 5) and guess: is this Aztec musician playing at a funeral ceremony or to wake up a priest? For the answer, click on ‘Occasionally even experts make mistakes!’ in the right hand menu. 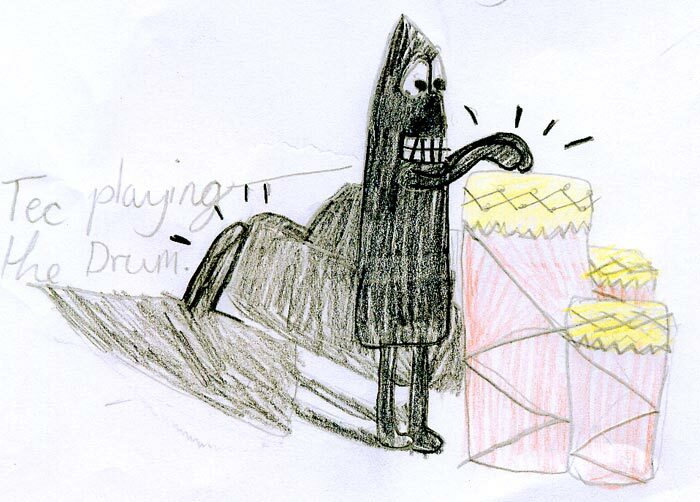 • A US music teacher has created a very useful, simply illustrated, introductory webpage on Aztec drum rhythms, based on making connections between language, maths and music (pic 6). He incorporates notation based on the famous 16th. century ‘Cantares Mexicanos’ manuscript - referred to in our teponaztli feature. • There’s been a lot of debate as to whether the high civilisations of Latin America played stringed instruments - the established ‘line’ is that they only used wind and percussion. If you visit the site of the US Princeton Art Museum’s ‘Music from the Land of the Jaguar’ exhibition (link below) you can listen to recordings made on several original pre-Columbian instruments, including a remarkable string-rasp-and-resonator Maya instrument (depicted on an ancient Maya ceramic vessel) that produces an extraordinarily lifelike imitation of a jaguar’s growl. • If you’re seriously interested in researching developments in music archaeology, you should make contact with ISGMA in Berlin - a link is provided below. Thanks to the dedicated work of our friend Adje Both - whose research website mixcoalli.com is also given below (’Music Archaeology of the Americas’) - there is a strong focus on discoveries of musical instruments at the Templo Mayor in Mexico City. You should find on their website a larger image of the oldest musical instrument yet discovered in the world...! • To hear some truly intriguing sounds of Aztec wind instruments, researched, reconstructed and played by Mexican Roberto Velázquez Cabrera, a mechanical engineer by profession, follow the links below NOTE: Sadly, since Roberto’s death, his site appears no longer to be available..
• The Aztec-style music from our website has been put to super use by Mexican postgraduate student in animation, Lucía Morgan, in her delightful film short ‘The Legend of the Bat’ (follow link below). Enjoy! 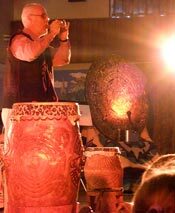 • For a visual feast in terms of reconstructions/recreations of pre-Hispanic instruments, there’s nothing better we feel than the work of pioneer practitioner Luis Pérez Ixoneztli, whose website is www.ixoneztli.com/. I wanted to say a big thank you for the information you shared with me regarding the ocarinas. I managed to finish the paper on time and i think it came out pretty good. Without the info you and the Mexicolore website provided, i would have struggled. Again, wanted to let you know that i appreciated your help and time. 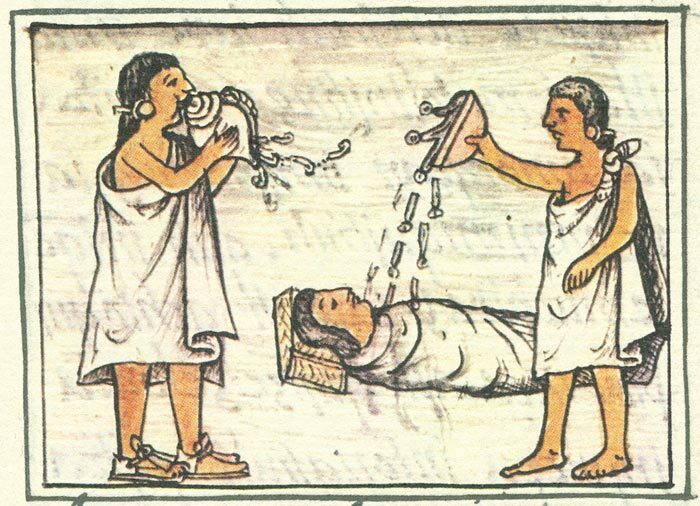 Hello, i am currently writing a research paper on the significance of wind instruments, specifically ocarinas, in Aztec music and society. Would it be possible to have a brief interview via skype or email to ask some questions? Thank you. Mexicolore replies: Very little! It uses Andean instruments (panpipes) and rhythm (huayño) rather than anything Mesoamerican. Pleasant and fun, but miles away from the Mexica! • Why do huehuetls have 3 legs? What is the significance of 3 or the number 3 in Mexica times? • I understand that according to Stevenson the huehuetl and the teponaztli are dieties banished to earth - do we know what deity they are supposed to be from? • Why are the legs (usually) in the shape of thunderbolts? What is the significance? • Why do instruments have different names - e.g. ‘zacatan’ for the Maya, ‘huehuetl’ for the Mexica: a guitar is a guitar no matter what part of the world it is in - considering the ‘pochteca’ (traders) travelled widely throughout the Americas and must have shared and learned different languages it is interesting that these names were never codified. i have only one question...was there a “separation” between men and women regarding the playing of musical instruments? Was there a gender equality? Did women also play musical instruments or only men? I’ve been looking for aztec dance music all over and cannot find any! where can i find cds to purchase or download? Mexicolore replies: We’ve just added some new ‘Aztec’-style music that’s downloadable from the ‘Tec ANIMATES A PAGE from the Codex Mendoza!’ microsite, and we’ve repaired a faulty download button for the music on Tec’s original Challenges and Puzzles microsite: try our Kids section! I recently visited chi chen itza and it was a wonderful experience. Upon visiting they had whistles for sale- jaguars, skulls, turtles. Unfortunately, I was unable to purchase a whistle. Is there any way to find the jaguar whistle online? Please help! I teach music at a small school in Pennsylvania, USA. My 3rd graders are studying Pre-Columbian cultures and I would like to make instruments with them that are representative Aztec instruments. Do you have any plans for projects like this or do you know where I can find any? Thank you for your fabulous website!! Mexicolore replies: We’re working on this excellent idea, but slowly! Try the link given in comment 5 below. Mexican engineer/musician/researcher Roberto Velazquez and we are collaborating in this field, but have nothing prepared yet that we can pass on. But we’ll get there...! 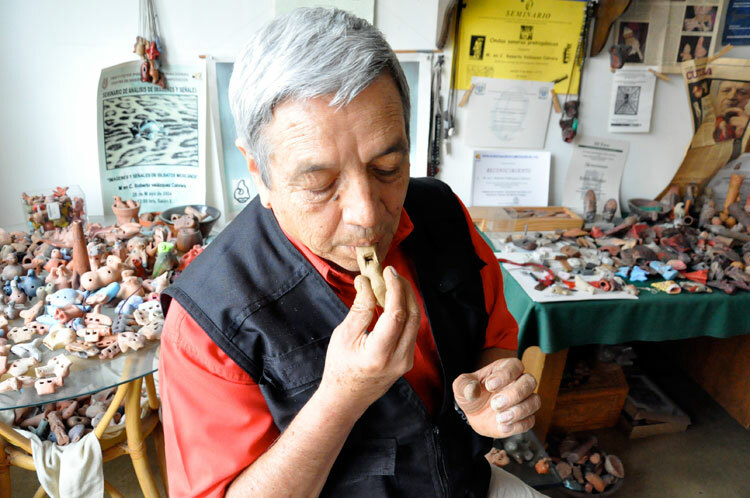 I’m trying to learn more about making clay whistles, esp. ones like the double chamber Peruvian whistles in which one chamber has water, and when it is tipped the water flows into the other chamber and sounds the whistle. Can you direct me to any good sources of instructions? Thanks, I’m enjoying all the info on your site. Gracias por esta pagina y por el contenido. Yo pertenezco a una danza azteca localizada en san jose, Ca y estoy tratando de aprender nahuatl por mi propia cuenta y vaya que es dificil encontrar paginas que contengan buena informacion como esta. La voy a recomendar a mis amistades. I bought what I believe to be a clay vessel flute in the shape of a turtle with only front legs,15 holes and magnificent sounds of music. Could this be the type cured underground in fire and ancient? I saw one very similiar on "Antique Road show" and mine has same sound when you hit the outside with your fingernails to prove it is not a modern item? Mexicolore replies: Thanks for sharing this with us, Jean. We need to see a picture of this to shed any more light on it. The ‘15 holes’ seems to hint that it isn’t a Mesoamerican instrument... If you’re in the London area we could meet and share ideas (and sounds!). I found this article very interesting. I love chaconnes, sarabandes, and fandangoes. This makes me curious about Aztec music. Thank you. Mexicolore replies: Thanks for writing in, Steve. Glad you enjoyed visiting the site. More and more people are discovering the wealth of musical output from Mexico both before the Spanish Conquest and after it!